Hit the beach in style! These pictures of flip flops prove there is something for everyone in this casual shoe category. What would summer be without a colorful pair of flip flops? Whether you choose to sport your sandals at the beach or to a backyard barbecue, check out this unique selection of flip flops, filled with personality! Flip flops have embraced many of the latest trends in footwear. Destined to become a summer favorite, these colorful flip flops are wardrobe-worthy when the temps heat up! 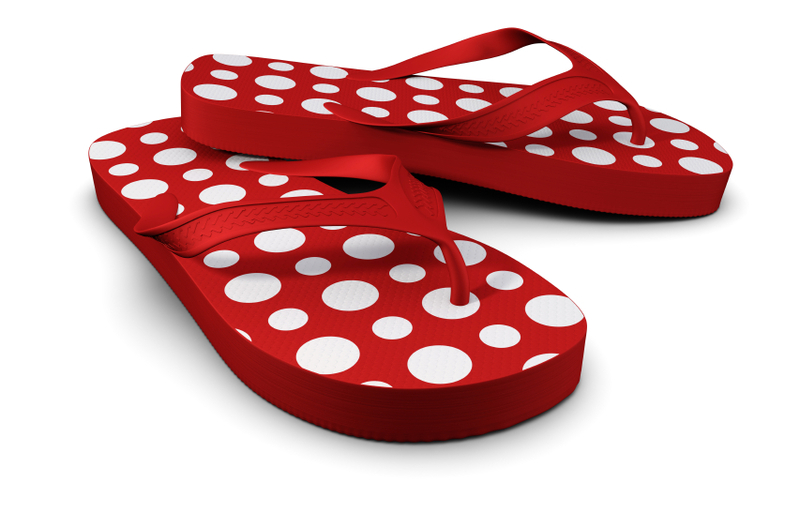 A sunbrust screenprint makes these unique flip flops just as fun to take off as they are to put on! Show off your girly side! What could be prettier than flowers? Polka dots and flowers! Get girly with a pretty in pink pair of flip flops. When paired with short shorts, these flip flops are sure to demand attention. Flip flops aren't limited to the beach. Show off your sunny and cool style and pair up your flip flops with your favorite pair of denim and a sun hat. A black patent pair of flip flops adds a touch of sophistication to this casual shoe design. Shop for special details such as unique stitching and adornment for a pair that can work overtime from the beach to cocktails! A classic pair of leather things are sure to work with all your summer basics. To ensure the construction of your leather shoes, keep them out of water! These thongs are for looks only. Striped flip flops are playful and quirky! Although their patterns are wild, these shoes are just plain fun! Fetch up an Asian-inspired pair! Chinese inspired sandals are sure to make a trendy statement. Pair these with wide legged yoga pants for a zen-ful take on this beach staple! No matter the color you choose, flip flops are perfect for everyone. Get playful and mix and match flip flops to complement your wardrobe and bathing suit. Stock up on extra pairs for communal bathrooms and showers. Stash a pair in the trunk for emergencies. Flip flops, with their cheerful looks and easy care foam or rubber, are a water-friendly sandal that never goes out of style!